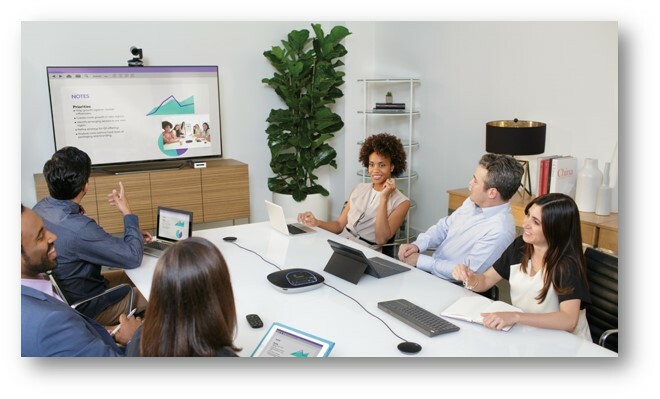 Microsoft® and Logitech® have collaborated to revolutionize the Skype® for Business experience and bring it to every meeting room in the enterprise. This large-room package delivers an amazingly easy-to-use and high quality video and audio meeting experience, optimized for mid-to-large conference rooms. Complete Skype Room Solution combines Microsoft Skype Room System, Microsoft Surface™ Pro 4 with custom meeting software, Logitech SmartDock A/V Control Console, Logitech GROUP camera + speakerphone, expansion mics, extender box and remote control. The Logitech GROUP Kit includes everything you need, and it works with the video conferencing and collaboration apps you already use, including Microsoft Skype for Business. Included are Logitech's ConferenceCam with Speakerphone, Intel NUC for room controls, and preconfigured software for easy deployment, delivering the same great experience in every room. This kit has everything you need to get up and running as quickly as possible with Skype for Business. Just add your own display, and you're room is ready to use!